Cinque Terre are not just one place, Cinque Terre literally means Five Lands and it is indeed a stretch of coastline with mountains heaving themselves from the intense blue of the Mediterranean Sea and five beautiful villages clinging to the rocks overlooking the sea. Every village looks like a nativity scene with its pastel colored small houses and here it seems that time has not passed. 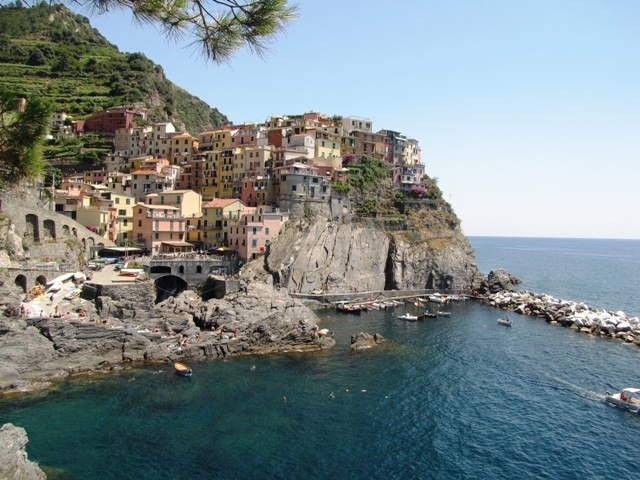 It is difficult to choose which is the best village where to stay in Cinque Terre. But we are locals and we can help you to make this tough choice. First of all we have to tell you that all the villages are gorgeous even if each one maintains its personality. Distances between the villages are very short by train and you absolutely have to visit all of them and to take your time to get in touch with the real soul of these places, discovering them slowly. This is the order if you come from La Spezia and go west towards Genoa and Portofino. Here everything is steep and narrow and there are not big hotels. But Cinque Terre are becoming more and more famous so that you have to book well in advance if you want to find the best places to stay. A handful of houses clustered around a small harbor, Riomaggiore is easy to reach if you come from La Spezia or from Tuscany. You can get there in 10 minutes by train from La Spezia or you can reach it by car. But we advise you not to use your car in Cinque Terre because the streets are very narrow, it is difficult to park and not all the villages can be reached. When you pack your luggage keep in mind that all the villages are closed to traffic: try to travel light! Riomaggiore has a small rocky beach and is the starting point of the famous Love Path, the “Passeggiata dell’Amore” that unfortunately now is closed because of a landslide. 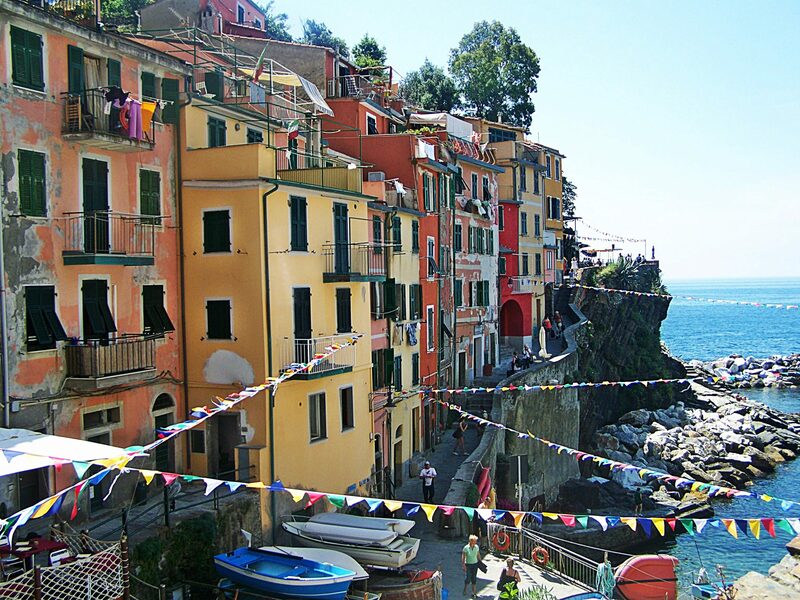 The next village is Manarola, one of the most photographed. It has a cute, tiny port carved in the rock, so small that many boats are sheltered in the street and in the square of the village. 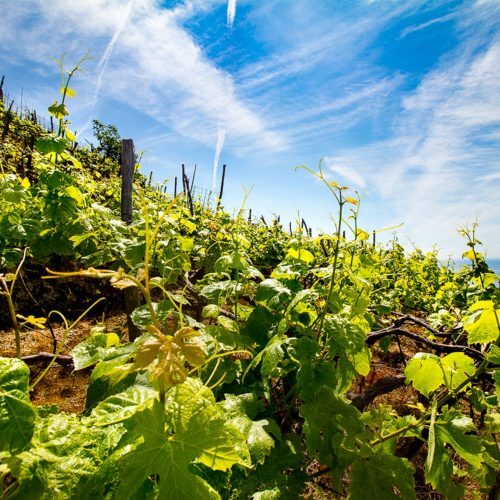 Manarola lays among the famous terraced vineyards and is a perfect place to enjoy a wine tasting. There’s a small toll parking 300 meters above the village but it is often crowded with tourist coaches. In my opinion, Manarola is the perfect spot for a romantic holiday. Be aware! 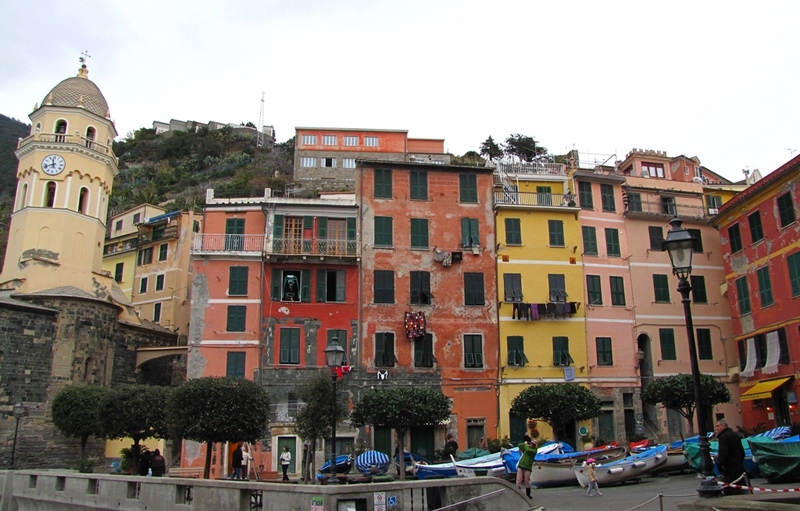 Corniglia is the only village in Cinque Terre that is not on the sea. It is perched on a hill above the Meditarranean. It’s almost impossible to reach it by car and, when you arrive by train you will have to take a small bus that will bring you directly from the train station to the village square or be prepared to climb 382 steps. But what a gorgeous view! Corniglia is the quietest village among the five. 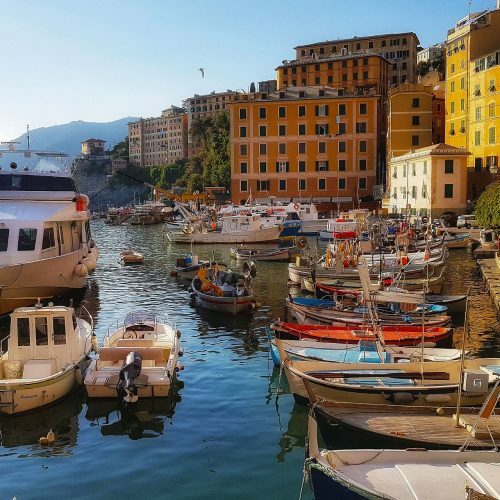 For sure is the most famous of Cinque Terre villages, with the tiny harbor, the small sandy beach and the beautiful medieval church built on the water. It is an icon of Cinque Terre but because of this, it is often very crowded. It’s a lively village, with many restaurants and bars. A perfectly romantic spot early in the morning or in the evening, to enjoy an aperitif in the square looking at the sunset. Monterosso is the last village of Cinque Terre toward West. 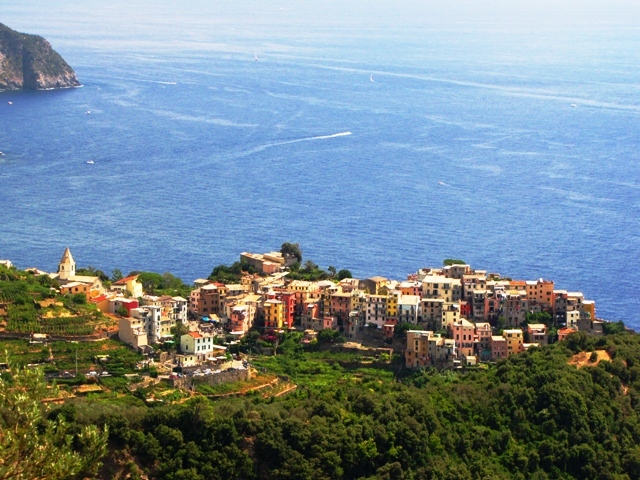 It is the largest one, composed by two parts, the old village and Fegina, with the widest sandy beach in Cinque Terre. 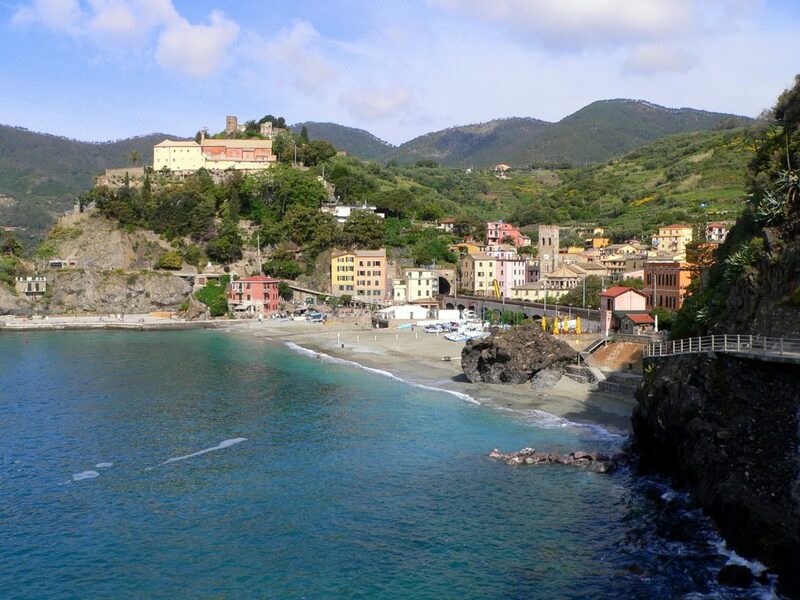 Monterosso is the best choice if you travel with children. The landscape is less vertical and here you will not have to climb all day long. There are also two parking that cost about 15€ per day. Here you will find some larger hotel. So, are you ready to make your choice? Whatever it will be, you’ll be excited by the beauty of the place.